Technidream is a triangle shawl worked from the top down in a striped zig-zag pattern. Four bold colors of a fuzzy mohair yarn are combined with an open stitch pattern to create a lightweight shawl with incredible softness and warmth. This shawl is generously sized to keep you cozy, but can easily be made larger or smaller by adding or subtracting pattern repeats. 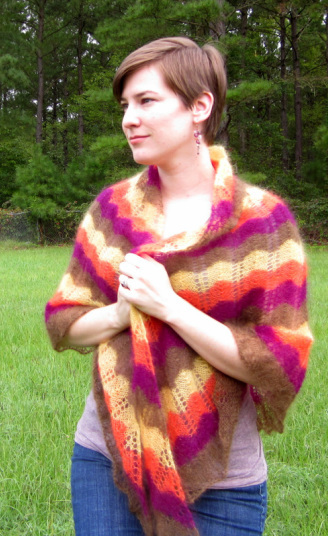 Make a colorful stripy shawl and use up all those leftover balls of lace or sock yarn. A total of 750 yards is needed to complete the shawl as written. The zig-zag pattern transitions into a border of gentle leaves. Stitch patterns are written and charted. Knit Picks Aloft (75% mohair, 25% silk; 246 yds/225 m per 25 g ball); 1 ball each color: Daisy (color A), Koi (color B), Fairy Tale (color C), Mongoose (color D).